A major winter storm will arrive tonight as low pressure moves up the Ohio Valley and Arctic high pressure entrenches itself to our north. Most of today we’ll be enjoying the calm before the storm as clouds overspread the area and cold dry air filters into place. Look for high temps to range from 0 in the far north to 25 in the far south. Here’s a general top-level look at the storm’s expected evolution. Light snow develops tonight with heavy bands arriving tomorrow morning from SW to NE. Warm air works in aloft tomorrow afternoon, bringing a change to sleet and freezing rain for the coastal plain. It remains to be seen just how far NW that warmth aloft can make it, but one thing we can be certain of is that the surface will remain cold enough to avoid plain rain. If you’re looking for a full analysis of this system, you can find it on the weather.us blog. It was written yesterday, but remains completely relevant this morning other than perhaps a few small tweaks to the snow map. If you remember the long blogs I’d write on this page ahead of big storms back in the day, you’ll be quite familiar with the style! Generally speaking, here’s what I’d expect from this system in ME/NH. Mountains: all snow. Mostly pure powder, some slightly denser snow but never any wet snow. 18-24″ with isolated 30″ totals in the higher terrain. Wax up those fat skis! Coast: snow through Sunday midday. Change to sleet Sunday afternoon, with some freezing rain possible at the shorelines. 8-16″ snow and up to 1/4″ ice in those areas that see freezing rain. 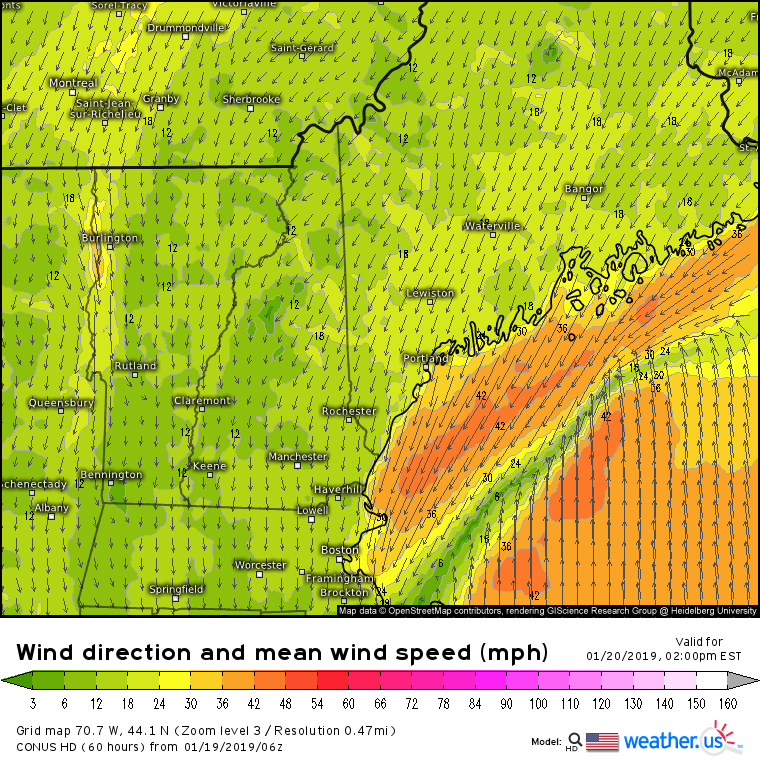 As the storm cranks up, look for winds to strengthen out of the NNE on Sunday afternoon. This will lead to blowing and drifting snow, especially in the mountains. At the coast, the wind and ice combo is never a good one, so expect some power outages, though thankfully the ice amounts expected (.1 to .25″) won’t be enough to cause crippling impacts. Snow, sleet, and ice depart the region Sunday evening with strong NNW winds bringing in the latest shot of very cold air. Hi Jack, your forecast is for mountains, foothills and coast. What about inland between the coast and foothills? We enjoy your forecasts, keep them going!